When He lost He became the best! This chapter is about the many beauties of Chess. There are many things to say about the great game of chess, however one of my favorites is that chess has no prejudice, which is that every person can play! Elder people, young people. People from all over the world play chess, and against people from different countries as well. Today on the World Wide Web Chess is the most popular game being played. I have many times played people from other countries. Almost on a daily basis do I find myself playing foreign competition. People with different religious beliefs can play against each other. People with handicaps can play chess. Theres a league with blind people playing chess, in Braille. There are quite a few blind chess masters a mater of fact. Chess as I previous stated discriminates against no one. Probably my favorite feeling about this is that young people are playing more and more chess. I love when parents tell me they play their children, and they are proud to point out that they no longer can beat them anymore. The basis of my title! One story I would like to share with you is this of a very old gentleman. He came up to me one afternoon in one of my after school programs and complemented me, saying how he feels it to be a great thing to be able to teach children so young this game. We went on talking for a while and he told me hes learning just now how to play. He told me he purchased a book on chess and reads it with his grandchildren. The sparkle he had in his eyes when telling me that his grandchildren are actually teaching him how to play will last with me forever! What a gift this game has given to this particular family. The following story is on the beauty of different ages playing with one another. Although the previous story I find to be very moving, most age differences are a little more united. One thing I often tell parents when explaining to them how great this game is, is that a child doesnt have to have any physical talents. They do not have to be 6 feet 3 inches tall or run the 100-yard dash in less than 10 seconds to play chess. All a child has to do is learn and they are on their way. This brings me to the story of chapter 6. Many children are playing at a very young age, and if taught properly they very easily become strong chess players. The better they become the more interested and so on. The majority of the students I teach seem to be around the ages of somewhere between 6 and 9 years old. The school grades range from k through third grades. The older children for one reason or another become more active in many other things and busier in their studies to seem to have the time to dedicate solely to chess. School becomes more difficult and there are many more activities available to them or they just want to hang out with the older kids. One of my students is the exception. During the summer months I run a full time chess camp. The children play and learn all the strategies needed and play in daily tournaments. One of our activities is going to the park and just running around , playing games such as tag or other park activities. Now you would think that 11 and 12-year-old children would not be associated playing games like these with 6 and 7 year old children. Just the opposite! Some of the top players in my programs are very, very young and have gained a mutual respect from all the older children. This I feel to be one of the very true beauties of this game. First and second graders have respect from 6th and 7th graders. The next story Im about to tell you is about an eleven-year-old student of mine. The younger students will listen to everything I feed them about openings , middle games, and endgames theories and so on. The older students usually have a different attitude. They know how to play chess! During my summer program this student was very active in camps throughout the city. Soccer camp. Fencing Camp, etc. Each week something different, and very competitive in all. Towards the end of the summer he finally signed up for chess camp. 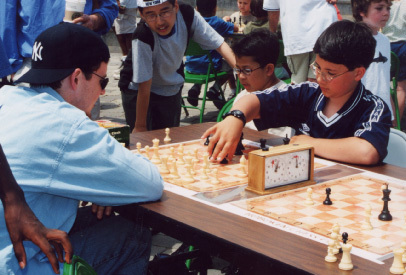 This boy was indeed a pretty good chess player, having a love for the game and a popular computer program to challenge. I worked hard with him, but no matter what, I had trouble getting through to him as I have always been able to with the others. I would show him a check mate pattern and he would say "I like to mate the other way" Or I would teach an opening and he would attack , moving the same piece twice, a no- no in opening theory. And then it finally happened. Tournament time. A daily occurrence at my camps. A time where everything I have taught gets to be applied in actual play. This strong eleven-year-old boy was paired up against one of my six-year-old students. This very petit 6-year old, sweat little adorably boy, out of all the other children, would be the first child any chess bully would want to play against. He would look at you with these big brown eyes, hardly being able to reach the chess pieces. As he moved d5 in response to E4 he would knock over the queen trying not to giggle. The center counter! A most aggressive defense to E4. As white captured the pawn , another piece would be developed. As white would protect, a second piece would be developed. Shortly black would have an overwhelming advantage. White didnt panic, after all this was a little 6-year old he was playing, you know. Then black castled Queenside, a sure sign that a fight is about to take place! What was happening here? Could it be. Then black offered a knight. White must have been thinking "six-year olds should be playing checkers. These Kids should be playing with kids their own age. I knew this would happen". White gobbles up the knight. The bait has been taken. Check. Then check again. A few moves and the UN-thinkable- checkmate! A six-year old beats an eleven- year old. I just watched. A moment alone was needed. This eleven- year old was devastated. How could this happen. I complemented this 6-year old child, Jake Simon, on developing his pieces, sacrificing his knight, and using a check mate pattern he had learned just the day before. He told me he has been practicing that opening and I assured all my campers that all could gain by study and practice. He also learned and now believed in something my dad once told me, No matter how good you are, there is always someone trying to be better than you. So practice and be the best you can be. Today William has won numerous first place awards, winning top boards, the highest honor in tournament competition, on two different occasions. He has finished 6th in the New Jersey state championship and recently in a New York tournament defeated the New York City champion. Oh year, he sometimes losses to second graders! William is now the top player in my camp!